« The Olympics have come to town! Following our earlier blog post announcing that we had embarked on a major project with Waters Corporation to supply software as part of their new ‘Omics Research Platform Solution we can bring you a progress update. The formal agreement has been signed and a press release made by Waters Corporation, which was reported the same day by GenomeWeb News. 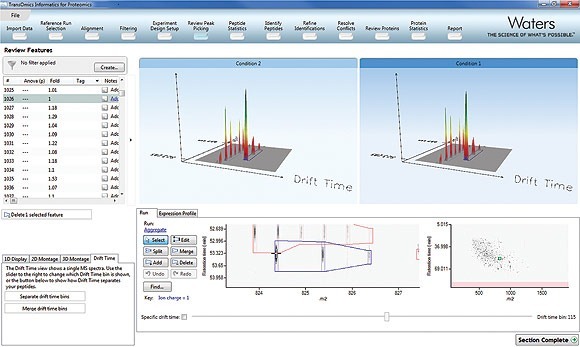 TransOmics™ Informatics software is exclusive to Waters and separate to our own Progenesis LC-MS and Progenesis CoMet software but combines core features of the Progenesis approach with ProteinLynx™ Global SERVER 3.0 and MarkerLynx™ XS for HDMS data analysis. Representatives from both Waters and Nonlinear have shared what they think this solution will provide. Our team of software developers, application scientists and product specialists have been involved in helping to demo the software at recent events including ASMS 2012 held in Vancouver Canada, May 2012 and the EuPA/BSPR meeting held in the UK, July 2012. Our team have reported back on the high number of visitors with keen interest at both the Waters demonstration sessions and both the companies stands. Waters Omics Research Platform Solutions with TransOmics Informatics provide analysis of complex data sets generated by large-scale proteomics and metabolomics experiments. If you want to learn more you can read a copy of the press release or visit the Waters website for more technical information about the ‘Omics Research Platform Solution. This entry was written by Paddy Lavery, posted on August 6, 2012 at 3:15 am, filed under August 2012 and tagged Progenesis CoMet, Progenesis LC-MS, Waters. Bookmark the permalink. Follow any comments here with the RSS feed for this post. Post a comment or leave a trackback: Trackback URL.